I think I may be a bit crazy to turn on my oven right now. 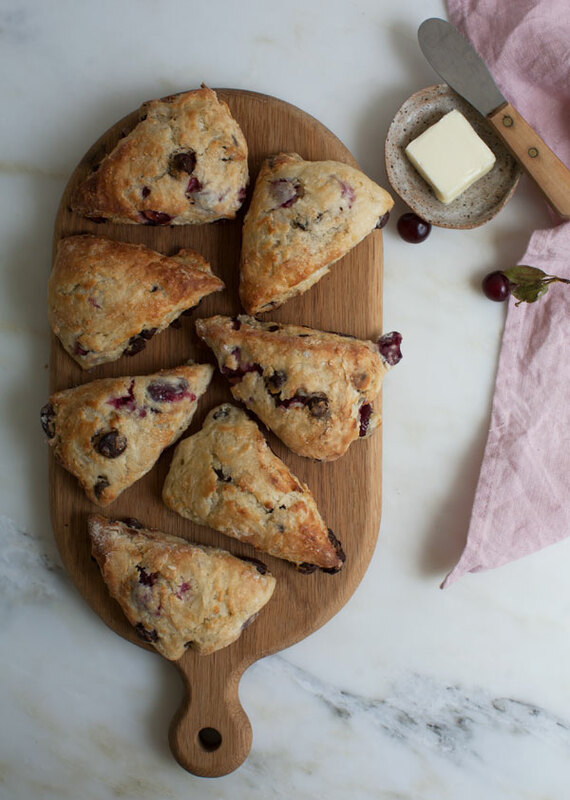 Next week is definitely going to a be an oven-free recipe, but a few days ago I was craving a baked good and I had a pile of sour cherries that needed a home…so, scones! Of course, these can be made with regular cherries, no sourness needed, but man do I love them. Their tartness is so welcomed against the buttery goodness of this scone and sings against the rich chocolate chunks. I like to think of them as the unicorn of the cherry world. This is my basic scone recipe. It never lets me down and as the season’s change, I swap the ingredients, add citrus zest of all kinds to it and increase or decrease the sugar depending on those added ingredients. If you’re in the mood for a baked good in the dog days of summer, here are you! In a large mixing bowl, mix together the flour, sugar, baking soda and salt. Using a box grater, grate the butter into the dry ingredients and mix quickly, breaking up the butter so it resembles the size of small peas. 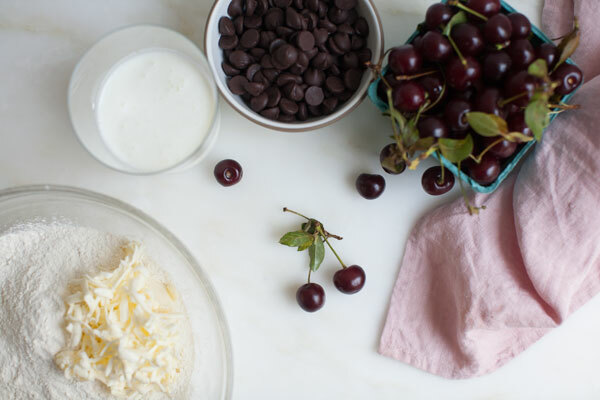 Add the cherries and toss so they’re evenly distributed throughout the flour. Next, do the same with the chocolate chunks or chips. Create a well in the center of the flour mixture and in one batch, add the buttermilk. Using a wooden spoon or spatula, mix it together until it forms a shaggy ball. Drop the dough onto a lightly floured counter and knead a few times, being sure to not over handle it, which will result in tough scones. Form the dough into 1 1/2-inch thick disk. 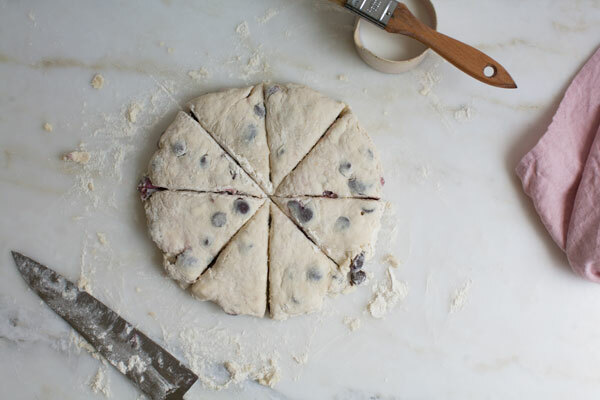 Using a knife, cut the scones into 8 equal triangles. 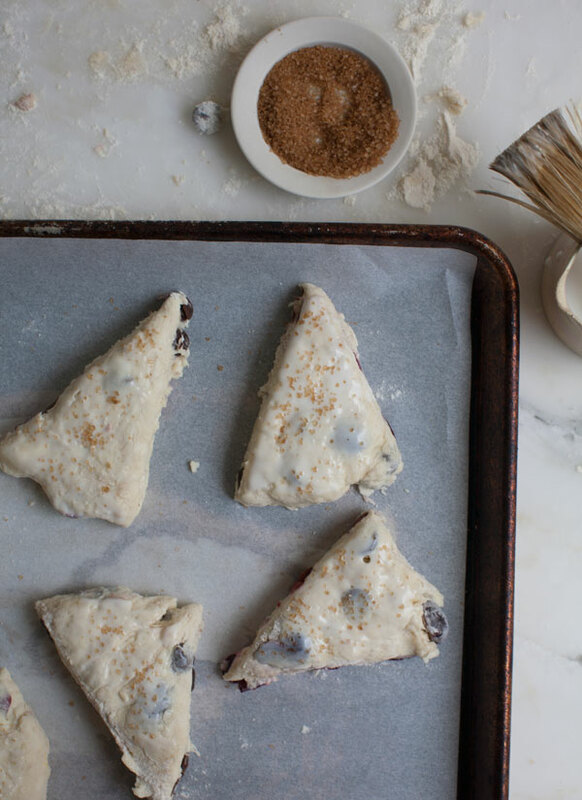 Transfer the scones to the baking sheet and put in the freezer to chill for 15 minutes. At this time, preheat the oven to 425 degrees F.
Brush the tops with the buttermilk and sprinkle with a bit of turbinado sugar. Transfer the scones to the oven to bake for 25 to 30 minutes, until a skewer inserted into the centers comes out clean and the scones are golden brown.